SOUTHINGTON - It was 36 degrees at YMCA Camp Sloper this Saturday. Snow was on the way. Ice covered most of the pond. And people were jumping in. 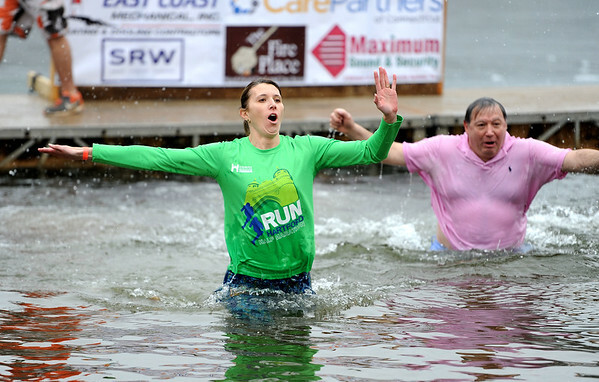 Over 200 took the plunge into freezing, chest high water at the 14th annual Sloper Plunge. Thirteen teams, along with many sub-teams, braced the cold to raise money so kids can attend summer camp. The donations each team raised provide children from low-income families with scholarships so they can go to camp. 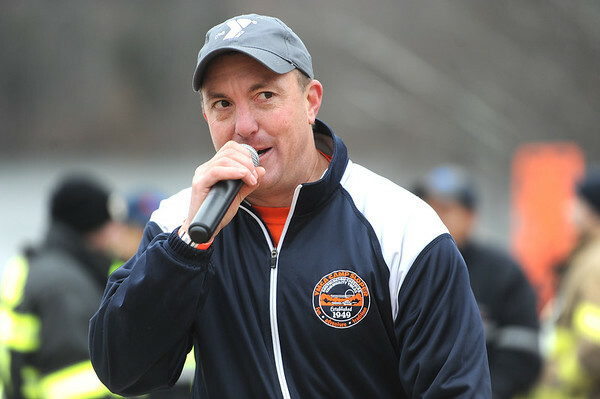 Mark Pooler, the event organizer, said the Southington YMCA team surpassed its goal of $5,000 and is very close to $8,000. The goal for the entire event is $50,000. “I’m confident we’re going to hit that,” Pooler said. “Summer camp is an amazing, amazing experience and we here at YMCA believe everyone should have the opportunity to go to summer camp even if they can’t afford it,” Pooler said. 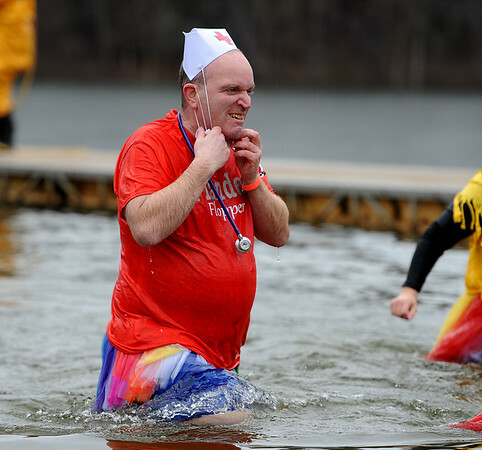 Around 500 spectators, bundled up in coats and scarves, watched the plungers leap into the water, scramble to the shore and race to their towels or to one of the two fires. The featured team was the Southington High School football team. 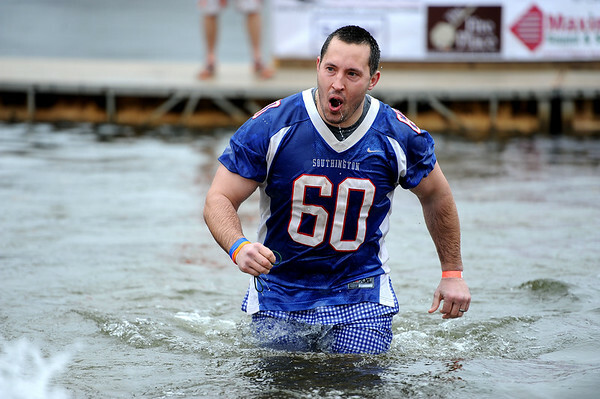 The players wore their uniforms to make the plunge. 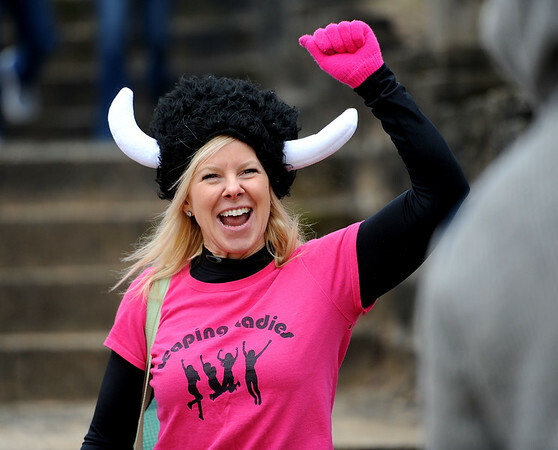 The Leaping Ladies team was doing the jump for the fourth year, said coordinator Dawn Pooler. “It’s one of our coldest jumps yet,” Dawn Pooler said. 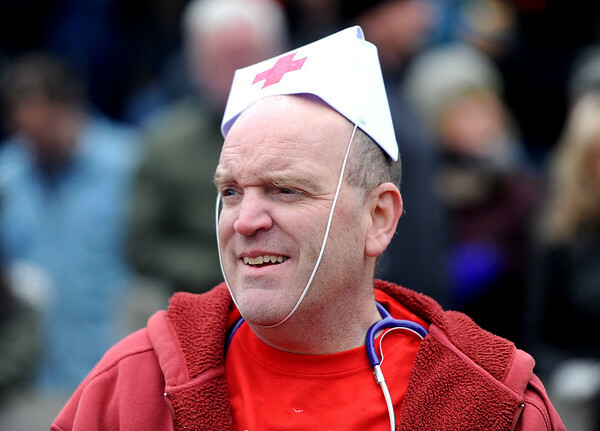 Many of the participants wore costumes ranging from tutus to aprons to quirky hats. Some carried large inflatable yellow ducks while others strapped on GoPros to capture the moment. 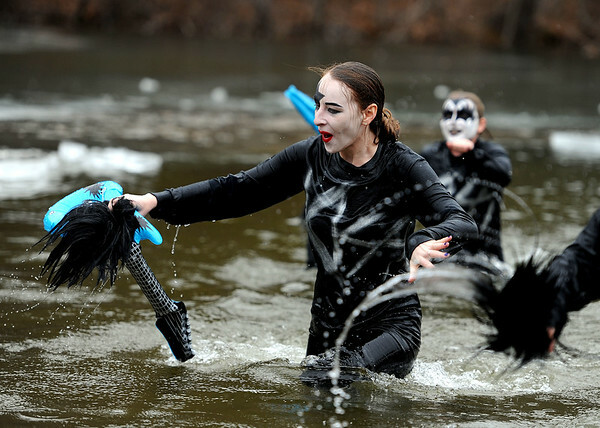 Team Lake Compounce, wearing Kiss costumes and makeup, jumped holding drumsticks and blue inflatable guitars. “We wanted to stand out,” said team member Megan Major. “Lake Compounce is known for the best costumes,” said coordinator Ciara Devaney. It was her fifth year making the plunge. 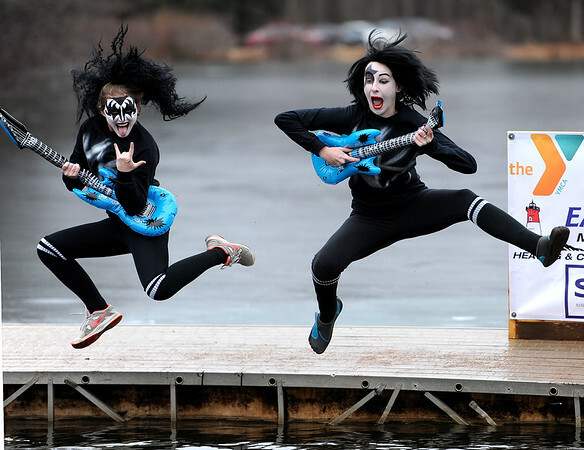 Donning rainbow tutus and striped stockings, the JFK jumpers, from John F. Kennedy Middle School, prepared for the icy water. It was coordinator Denise Berry’s second year. She said she started jumping because she went to camp as a kid and wants others to have the same opportunity. Teams of teachers, police officers, fire fighters, politicians, athletes and members of the Southington Board of Education leapt into Camp Sloper pond with the hope that more campers could enjoy that pond in summer. 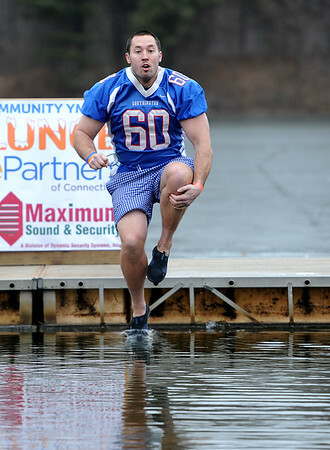 The Cheshire YMCA also participated in the Sloper Plunge, with their proceeds going to Camp Quinnipiac. Posted in The Bristol Press, Southington Herald, Bristol on Sunday, 20 January 2019 21:19. Updated: Sunday, 20 January 2019 21:22.